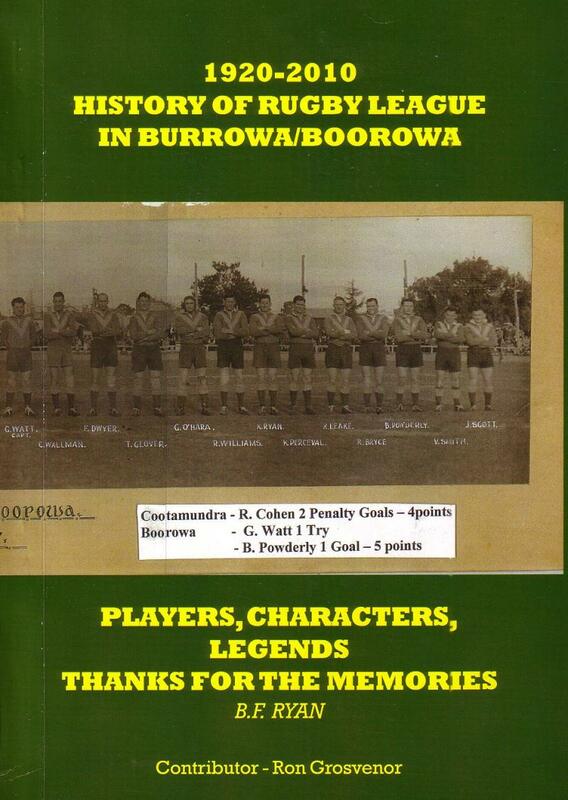 During my search for the life and football times of Wild Bill Brogan I came across a fact that he was captain/coach for a little country town in NSW called Boorowa. The year was 1935 and Wild Bill was 35 years of age. 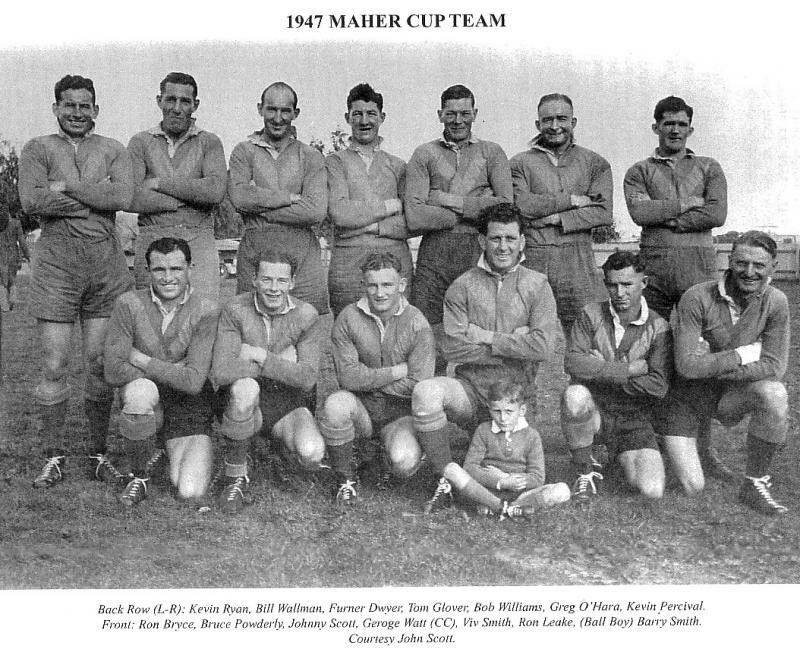 He had Capt/Coached Wests in 1933 and unfortunately Wests won the wooden spoon that year. On a happier note they won the premiership in 1934. Thats Uncle Bruce second from the top left . This Southern N.S.W. team beat the great French side of 1951. The score was 20 to 10 and 4 of the Southern side came from Boorowa. Above is the French jumper worn by the famous Puig-Aubert. Just for the record the Frenchmen beat Austalia in 2 Tests. 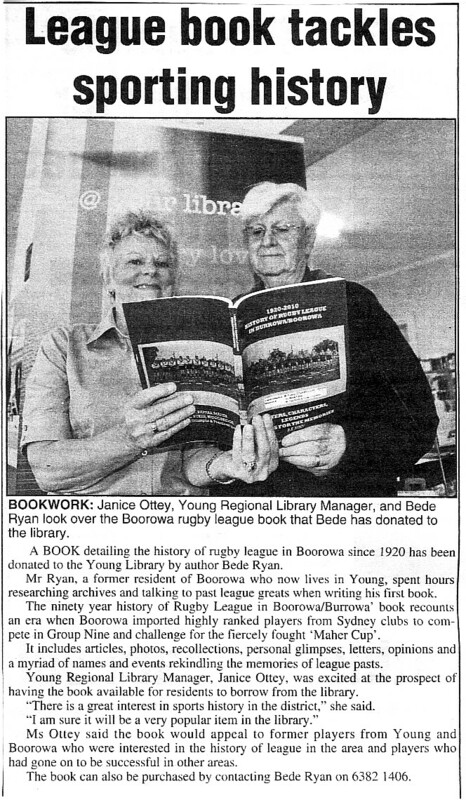 This book written by Mr Bede Ryan covers the history of Rugby League in Boorowa. It is the best Rugby League book I have read for a long time and the facts and figures and pics are a must for anyone who loves their Rugby League. Just one of many photos in this wonderful book. 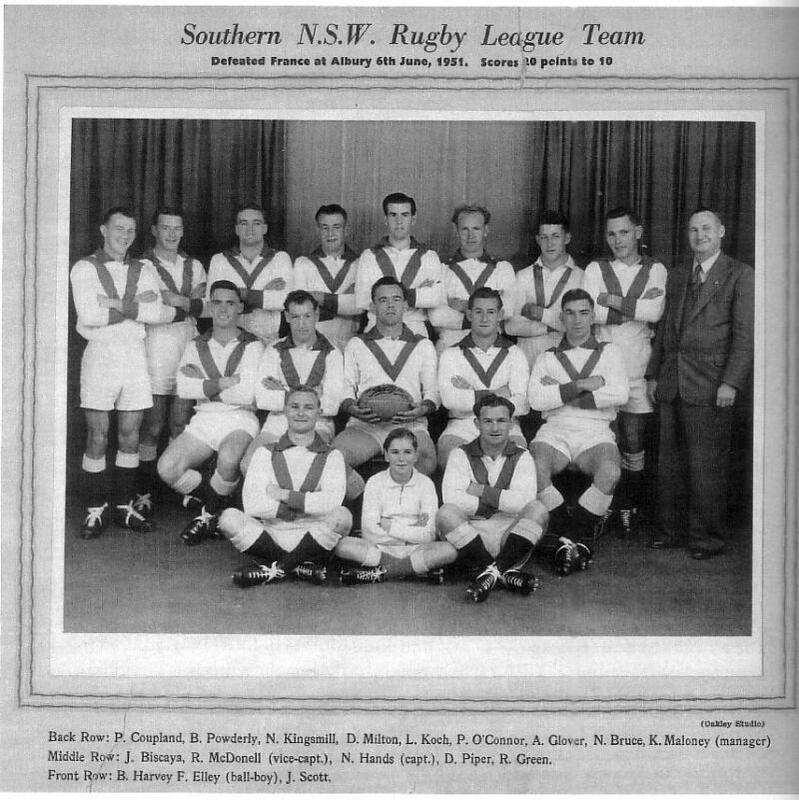 (Thanks to Terry Williams from the Rugby League Museum﻿ at Moore Park Sydney for this photo). they were Frank Clegg, Max Caldwell, Viv Smith and Jim Norman. My mum if she was alive would be so proud and happy that her brother was mentioned in your book. 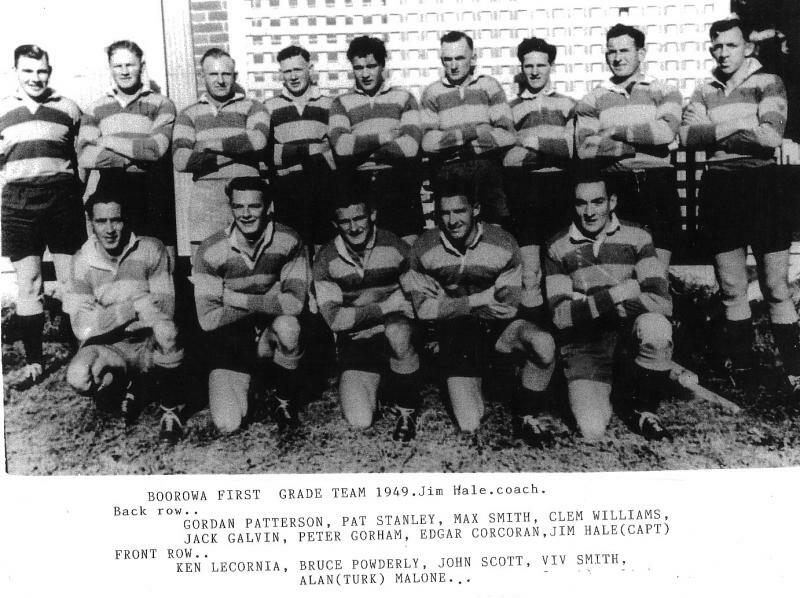 Boorowa played in Group Nine. To play with muscle, skill and spine. Were lured by small town offers. They beat off rival poachers. Led or coached the side. When they combined to join forces. Against other star studded teams. They won the cup four times. It was the stuff of small town dreams. Furner Bloody Dwyer played on with a broken neck. His bloody reward is in heaven. With the heroes of that day. Bruce Powderly was a star of the team. One of the best the country had seen. A butcher who did his own slaughter. To play for clubs in the city. He missed the train. More’s the pity! Multiple breaks to a leg, to his dread. Counting the weeks in his hospital bed. Was an early star of the team. He helped the team let off steam. Whose games he would aim to unsettle. Some families were always prominent. In many years were dominant. Read like an Irish census. Boorowa’s team was built on inclusion. Your skills were a welcome infusion. Worked tirelessly for the club for years. They expected no beg pardon. Are summed up by an unforgettable try. Scored under the posts, sealing a memorable win. It’s prized Group Nine position. Thanks David for your permission to display your great Ballad.